madonna-tv.com: 2012: MDNA Córdoba: The Day The Music Died. 2012: MDNA Córdoba: The Day The Music Died. The final night of a tour can often be something quite special. It's traditional for jokes to get played by crew members and tearful thank-you speeches to be made. When the show is definitely not being broadcast anywhere or filmed for future release then there's even more potential for some unusual things to happen on the night. So the last show on Madonna's top-grossing 2012 MDNA World Tour was always going to be an interesting gig. Originally the finale was to have happened somewhere in Australia in early 2013, but a couple of months into the tour the entire Australian leg was cancelled. Suddenly the final scheduled gig was happening elsewhere - a city Madonna had never visited before and one which few major international artists ever included on their tours. Córdoba in the North of Argentina is the country's second city and the beautiful Mario Alberto Kempes stadium a few miles outside of the city centre was the venue for Madonna to perform her MDNA concert for the very last time. The world was supposed to have ended on Friday December 21st 2012, but Saturday 22nd came nonetheless and under a blue sky and with temperatures reaching 40°C fans made it to the stadium that day - just 3 days before Christmas. Would there be any surprises? Well how about one of the biggest surprises ever at Madonna show - a power failure! Approximately 45 minutes into the concert, the electricity supply failed. As Madonna was performing "Open Your Heart" the music suddenly stopped, all video screens went black, all of the production lighting went off, the entire sound system stopped working! Thankfully venue lighting belonging to the stadium illuminated the stage but the show was ground to a complete and abrupt halt. Ever the professional, Madonna didn't just leave the stage when this happened - instead she spent more than 10 minutes without any electrical power and presumably not sure what was going to happen next, trying her best to entertain the crowd. In a massive stadium with over 40,000 people watching from a distance, this was almost impossible. Officials were unable to tell the crowd anything about what had happened or what might happen next (if indeed anyone knew) and so the waiting game began for the audience. As the minutes ticked by without any sign of the electricity returning many wondered if that was it for the night. Had we seen the end of the MDNA Tour perhaps? Much to everyone's relief, the power eventually came on again and at almost one hour after the show had come to an abrupt end, it started again. Madonna continued into the small hours of the morning (finishing up well after 2am) and then that really was it. 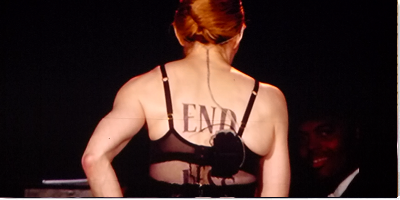 That was the end of the MDNA Tour and what an end! In almost 30 years of concert touring it is safe to say nothing so unusual had ever happened at a Madonna gig. Madonna-TV was there to capture everything and "MDNA Cordoba - The Whole Story" is an attempt to show you what happened on Saturday 22nd December 2012 at Madonna's final MDNA concert!